Dunaújváros (pronounced [ˈdunɒuːjvaːroʃ]; formerly known as Dunapentele and Sztálinváros; German: Neustadt an der Donau Serbian: Пантелија/Pantelija) is an industrial city in Fejér County, Central Hungary. The city is best known for its steelworks, which is the largest in the country. Dunaújváros is located in the Transdanubian part of the Great Hungarian Plain (called Mezőföld), 70 kilometres (43 miles) south of Budapest on the Danube, Highway 6, Motorways M6, M8 and the electrified Budapest-Pusztaszabolcs-Dunaújváros-Paks railway. The city replaced the village of Dunapentele ("Pantaleon up on the Danube"), named after Saint Pantaleon. The construction of this new industrial city started in 1949 and the original village was renamed Sztálinváros ("Stalin City") in 1951. After the Hungarian revolution of 1956 the new government renamed the city the neutral Dunaújváros in 1961, which means "Danube New City" (New City on the Danube). Dunaújváros is one of the newest cities in the country. It was built in the 1950s during the industrialization of the country under Socialist rule, as a new city next to an already existing village, Dunapentele. Dunapentele was not built on until the 1950s. The construction started on the Danube's right side. The area has been inhabited since ancient times. 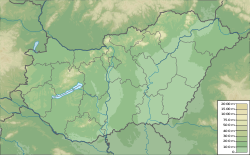 When Western Hungary was a Roman province under the name Pannonia, a military camp and a town called Intercisa stood in this place, at the border of the province. The Hungarians conquered the area in the early 10th century. The village of Pentele, named after the medieval Greek saint, Pantaleon, was founded shortly after. Between 1541 and 1688 the village was under Ottoman rule, and during the 150-year war it was completely destroyed. During the freedom fight led by Prince Ferenc II Rákóczi of Transylvania, the place was deserted again. In the 18th century the village began to prosper. In 1830 the village was given the right to hold markets days twice a week. In 1831 there was a cholera epidemic and which caused a small scale peasants revolt. In 1833 Pentele was granted town status (oppidum) by Ferdinand V. The citizens took part in the freedom fight in 1848-49. After the Second World War the new, Communist government started a major industrialisation programme, in support of its rearmament efforts. In 1949 Dunaújváros was chosen as the site of the largest iron and steel works in the country. Originally they were to be built close to Mohács, but the Hungarian-Yugoslavian relations worsened, and this new site was chosen, farther away from the Yugoslav border. The city was designed to have 25,000 residents. The construction of the city began on May 2, 1950 near Dunapentele. Within one year more than 1,000 housing units were built and construction on the factory complex began. The city officially took the name of Joseph Stalin on April 4, 1952; its name was Sztálinváros 'Stalin City' as a parallel to Stalingrad in the USSR. The metal works were opened in 1954. The city had a population of 27,772 at this time; 85% of them lived in nice, comfortable apartments, while about 4,200 people still lived in uncomfortable barracks which originally provided "homes" for the construction workers. In the middle of the 1950s, public transport was organized, with buses carrying 24,000 passengers each day. During the 1950s many cultural and sports facilities were built, the Endre Ságvári Primary School being the largest school in Central Europe in the 1960s. The official and obligatory architectural style and art movement of the communist system was socialist realism. Per definition the style’s meaning was communist, its form was national, and its preferred mode of representation was the allegory. There are several public statues and reliefs in the town, which represent the allegoric union of workers, peasants and intellectuals, surrounded by traditional folk motifs. Thanks to the inspiration of Bauhaus the buildings and monuments of this era (1949–56), like the forge, the cinema, the theatre, the hospital and the city’s schools where characterized by a structural functionalism, but the ideological function resulted in classicist decorations, like columns, tympanums and arcades, because of which the informal name of the style became ‘Stalin’s Baroque’ . In 1956, the construction was hindered by an earthquake and a flood, and in October by the start of the 1956 Hungarian Revolution. During the revolution the city used its historical name Dunapentele again. The Rákóczi radio station, which was created by the revolutionaries, broadcast from Dunapentele (in fact from a bus that was constantly moving around in the city so that it couldn't be located.) Even though the citizens of Dunapentele tried to defend their city, the Soviet army occupied the city on November 7th, 1956. The city came under martial law and soviet tanks were stationed throughout the city. After the revolution the city was still the "trademark city" of socialism in Hungary, and was presented as such to foreign visitors. Among the visitors were Yuri Gagarin and the Indonesian president Sukarno. The city also provided a scenic backdrop to popular movies. In 1960, the ten-year-old city already had 31,000 residents who celebrated its anniversary. On November 26, 1961 the city's name was changed to Dunaújváros (Duna|új|város meaning Danube-new-city; "New City upon Danube". See also Tiszaújváros) as a consequence of Stalin's death (1953) and the Hungarian Revolution (1956). In 1990 it became a city with county rights—as one of the then four, (now five) cities in the country that have this status but are not county capitals—in accordance with a new law that granted this status to all cities with a population over 50,000. Even though the population of Dunaújváros has been under 50,000 since 2008, it has kept its status as a city with county rights (along with Hódmezővásárhely, which is in a similar situation). The DUNAFERR factory complex is still is an important enterprise in the Hungarian steel industry, and a major employer in the area. Today, Dunaújváros is home to many new infrastructures (Pentele Bridge, direct highway link between Budapest and Dunaújváros), the new South Korean Hankook factory, Europe's biggest tire factory of Hankook, and Hamburger Hungaria, one of the largest containerboard manufacturers in Europe. This and other projects make Dunaújváros a new Hungarian boomtown. Thanks to its formal political and economic importance, the communist urban design, the socialist realist architecture and its unique atmosphere the town is the considerable memento of communism. Many of the half-century old buildings have received the protection of historic monuments, and the town is in the focus of growing touristic interest. In 2001 Dunaújváros had 55,309 residents (92.5% Hungarian, 0.6% Romani, 0.6% German, 6.3% other). Religions: 38.9% Roman Catholic, 8.3% Calvinist, 2% Lutheran, 37.8% Atheist, 0.2% other, 12.8% no answer. The current mayor of Dunaújváros is Gábor Cserna (Fidesz). The most popular sport is ice hockey, and the city is home to the Steel Bulls. The second most popular sport in the town is football. The town has one team playing in the top level league, the Nemzeti Bajnokság I, the Dunaújváros PASE. However the most well-known team is the defunct Dunaújváros FC which also won the 1999-2000 Nemzeti Bajnokság I season. The women's water polo team of Dunaújvárosi FVE won the 2018 edition of the LEN Trophy. ^ Meek, H A. (1953) Retreat To Moscow, The Architectural Review (Archive : 1896-2005) ; London Vol. 113, Iss. 675, (Mar 1, 1953): 142-151. ^ "Központi Statisztikai Hivatal". www.nepszamlalas.hu. Retrieved 8 April 2018. ^ "Debrecen.hu". portal.debrecen.hu. Retrieved 8 April 2018. ^ "Nikandrosz Galanisz". Elite Prospects. Retrieved 8 April 2018. ^ "Partnerstwo Samorządów Siłą Europy". 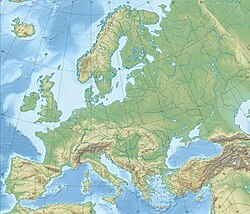 Europa Miast (in Polish). Retrieved 2013-08-13. ^ "Umbria - Town Twinning". Comuni-Italiani.it. Archived from the original on 2012-03-04. Retrieved 2013-08-21. Wikimedia Commons has media related to Dunaújváros. Wikivoyage has a travel guide for Dunaújváros. This page was last edited on 14 April 2019, at 00:01 (UTC).